Here where I live spring is magic! Really, I'm serious. We wait and wait, complain, it snows, we wonder if spring will ever come, then literally overnight... well I exaggerate, it takes just a few days of warm weather, and all of a sudden everything is green. It's like magic! One day I can see through all the trees in my back yard, and the next day I can't! How has Tuesday been for you? My day started off slow, it has been a weird day. But, it ended well. The sun came out, I went and boxed, got dinner at Panera, visited with my friend Amy and now I get to relax. Ok, ok, to the clothes! We don't need much explanation there, do we? 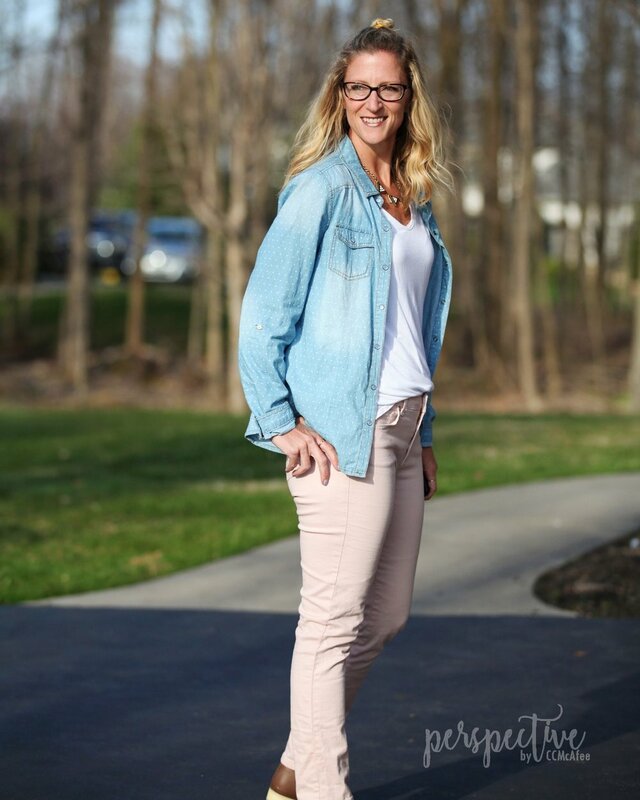 I paired blush colored jeans with my polka dot chambray shirt. It is a spring look, complete with layers. I like to layer in the spring. These flats are so cute. I find myself reaching for them often. I love the crisscross cut out of them. I may need to get me a pair of the open toed ones that I've linked for you. Those are way cute too! What is spring like where you are?